Software license monitoring (SLM) gives you the tools to manage your organization's software assets so that you can track product usage, monitor license compliance, and ultimately control costs. As an IT administrator or software asset manager, you may find it challenging to track products installed on numerous devices across a network. You run the risk of not only installing more products than you've purchased licenses for, but also of purchasing too many licenses. You can avoid these problems by using the SLM console to monitor and report on product licenses and usage across your organization. The SLM console opens in a web browser. It has four distinct pages to view data (Dashboard, Products, Administration, and Reports). The Dashboard pages display summary charts of key product and license data. These are useful for audit planning and optimizing your use of licenses. The Products pages display detailed data for products that are installed on managed devices. These pages include license data that is used to calculate license compliance in your organization, as well as reclamation and allocation data. Reclamation data shows tasks set up to take unused product licenses and reassign them to devices that need them. Allocation data tracks the cost of providing IT support to groups across your organization. As you work in the SLM console, you'll spend most of your time in the Products>Monitored page, which displays the products you want to actively monitor. After you've moved important products into this view, the Discovered view is where you'll look for new products that might need your attention. The products you don't need to monitor can be moved to the Ignored view so they're out of your way. If you're not sure where a product is, open the Products>All installed products page and search for it. You can then move the product to the appropriate view (Monitored or Ignored). NOTE: The Ivanti® Endpoint Manager powered by Landesk Windows agent can detect and record the usage of Microsoft Metro-style apps (also known as Windows Store apps). As a result, you can now track and monitor that usage in SLM. 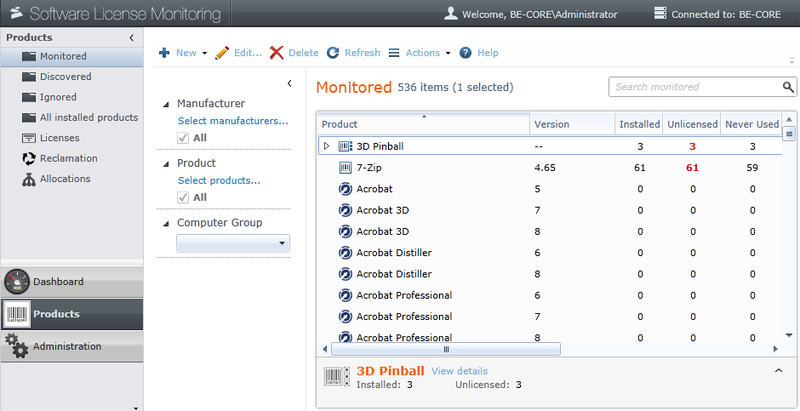 Use the Administration pages to set up computer groups, normalized manufacturers, and other defaults to customize the data appearing in the other SLM console pages. Use the Reports page to run any number of predefined or customized reports that show license and product data for devices across the network. 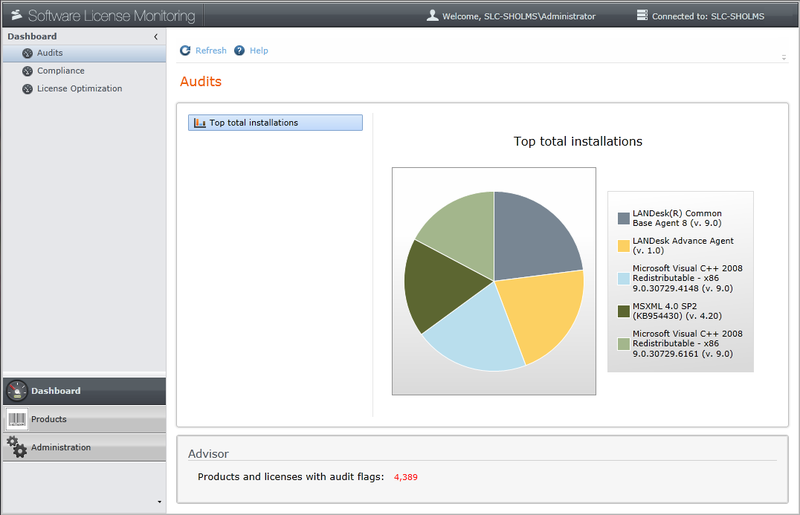 Users with a role definition that includes software license monitoring can view and edit data in the SLM console. Administrative users are assigned this role by default. Other users can be assigned View and Edit permissions for the software license monitoring role. IMPORTANT: The browser you use to view the SLM console must have pop-up blocking turned off. If it's turned on, you may be unable to view dialogs that open from the SLM console. If you have problems viewing items, make sure that your browser's pop-up blocking is turned off. Easily accessible reporting on product usage and license compliance, including number of times each licensed product was launched, last date used, and total duration of application usage. Product license sharing. For some products, a newer version of a product can loan a license to older versions, keeping your devices license-compliant at all times. Easily configured license parameters, including purchase and shipping information, license type, quantity, and serial number. Installation tracking and reconciliation, including items you track such as the license holder and physical location of the device the license is installed on, as well as additional notes. Passive, low-bandwidth monitoring. The software monitoring agent passively monitors product usage on devices, using minimal network bandwidth. Mobile device support. The agent monitors usage for mobile devices that are disconnected from the network and then sends data to the core server when the device is reconnected. Automatic discovery scans for installed products on managed devices that gather data based on the files associated with those products. License reclamation and allocations. You can set up a process that runs a reclamation task on licenses, freeing them for use on other devices. Allocate licenses to computer groups to establish chargeback costs for the IT support you provide. Software license monitoring requires the Ivanti agent to be running on devices you want to manage. The agent gathers inventory data from managed devices about which products are installed and how often they are run. This data is delivered to the core server every time a software inventory scan is completed, by default once a day. After inventory data is collected, product data appears in the SLM console's Products>Discovered page. As more inventory data is added, new product data is added to the Discovered view. As you review this data, you may find that some products are not found or not recognized correctly. You can use the SLM console to check for specific products, and you can add or correct product definitions if needed. If you want to monitor products on groups of devices (static groups) or by using queries (dynamic groups), first create them in the Endpoint Manager network view. These groups and queries will then be available in the SLM console, making it easier for you to review installed products organized by location, organizational group, hardware type, or any other criteria. To monitor your organization's compliance with product license terms, you'll need access to accurate license data. You can add this data manually, or import data from another source such as Ivanti Data Analytics. Once you've added information about your licenses, such as how many seats you have purchased, purchase date and expiration dates, type of license, and how the licenses are consumed, you can begin to review compliance statistics and reports that compare the license data with actual product usage. When you first open the SLM console, all products newly discovered by the inventory scanner are found in the Products>Discovered page. Select products from that list that you want to monitor and move them to the Monitored view. Monitored products can be linked to your license data and tracked in reports that show you how well your licenses match actual product usage. Some products may not be important to you, so you can move them to the Ignored view, excluding them from of license compliance calculations. Once a product is in the Products>Monitored page, you can edit its details, set up license allocations and chargeback costs, and define reclamation tasks. As you review the data associated with product and license compliance, you can generate a report of what's displayed. Reports can be formatted as CSV, HTML, PDF, XML, DOC, XLS, or image files. Once license and product data is established in the database, you can also use the Endpoint Manager reports tool to generate predefined reports showing all aspects of license and usage data.